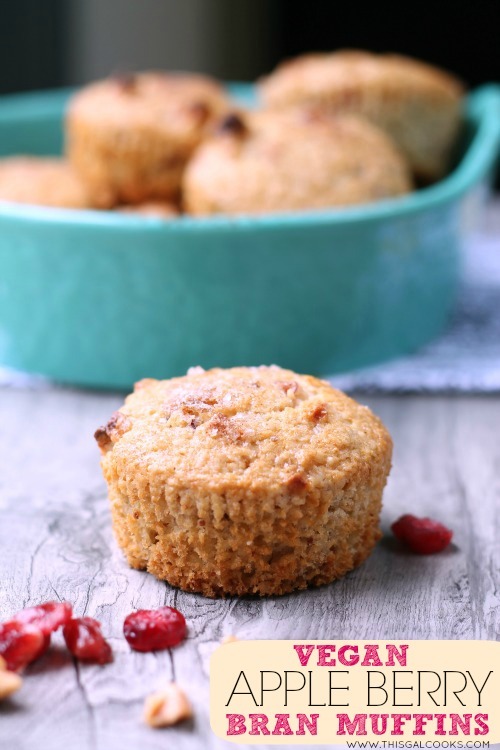 These Vegan Apple Berry Bran Muffins are full of flavor and nutrients and a healthy way to start your morning! I’m honored to have been selected to create a recipe with NatureBox products on behalf of Burst Media! Many of you know that I have a love affair with muffins. That love affair led me to create a vegan muffin recipe using the delicious Tart and Tangy Fruit Medley from NatureBox. The Tart and Tangy Fruit Medley consists of dried apples and cranberries. Yum. You may be asking yourself “what is NatureBox?” NatureBox is an awesome little subscription service that allows you to discover and enjoy healthy snacks on a monthly basis. What’s so awesome about this service? You don’t have to leave the comfort of your home to receive delicious, healthy snacks. NatureBox items are shipped to the 48 continental United States as well as FPO/APO addresses and PO Boxes. I’ll admit, it was super awesome to receive a box packed with healthy goodies via mail. It pretty much made my evening full of awesomeness after receiving the package when I arrived home from a long day at work. How about some muffins? How about some vegan muffins? Don’t be scared of the word vegan. There are some delicious vegan treats out there. Animal products aren’t the only things that produce great tasting eats. To make these vegan, I used rice milk, canola oil and egg replacer. All of these items can usually be found at your local grocery store. I hope you enjoy this recipe! In a small sauce pan, heat the orange juice over medium low heat. Add the dried fruit, turn off the heat and let sit for 10-15 minutes or until the fruit has soaked up most of the juice. Mix the flour, sugar, oat bran, baking powder and salt together in a mixing bowl. In a small bowl, whisk together the egg replacer and the water. In another mixing bowl, whisk together the rice milk, egg replacer mixture and canola oil. Make a welt in the center of the dry ingredients and pour the wet ingredients into the welt. Carefully mix together with a spoon until well blended and lumpy. Fold in the dried fruit and any orange juice that may be left in the pot. Spoon the batter into lined muffing cups until each cup is about ⅔ full. Sprinkle the tops of the muffin batter with cinnamon and sugar. Bake at 400 for 15-20 minutes or until the tops are lightly browned and a toothpick inserted into the center of a muffin comes out clean. 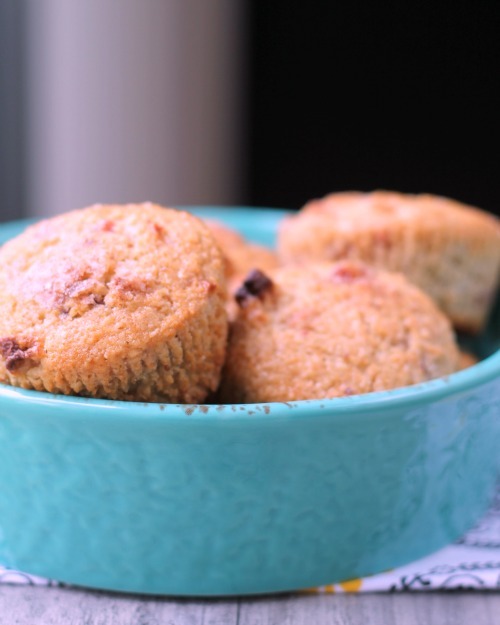 These muffins are a perfect way to start the day. I’ve been thinking about trying NatureBox. I love working with new ingredients and the box encourages you to find create new recipes to use the ingredients. Thanks for sharing! Naturbox is so SO good, Ashley! I’m trying to decide which pack to go with. Out of my pack that I got for this campaign, there were plantain chips, chewy cherry granola, the apple berry mix, almond mango rice crisps, and a few other things that I haven’t tried yet. Everything I tried was pretty good. My favorite was the plantain chips! I’m definitely going to go check out Nature Box! These are fantastic muffins Julie. So many wonderful ingredients-a good way to start the day! Awesome! Thank you so much for stopping by, Tanya! Hm, I haven’t tried egg replacer yet. Good tip! These muffins look super yummy! I’m game! I could use more bran in my life! These look great Julie!! Looks good and healthy, I’m not familiar w/ NatureBox, will have to check it out. I share in your love affair for muffins! hehe. Love these! Julie, this recipe makes me yearn for a rainy day! 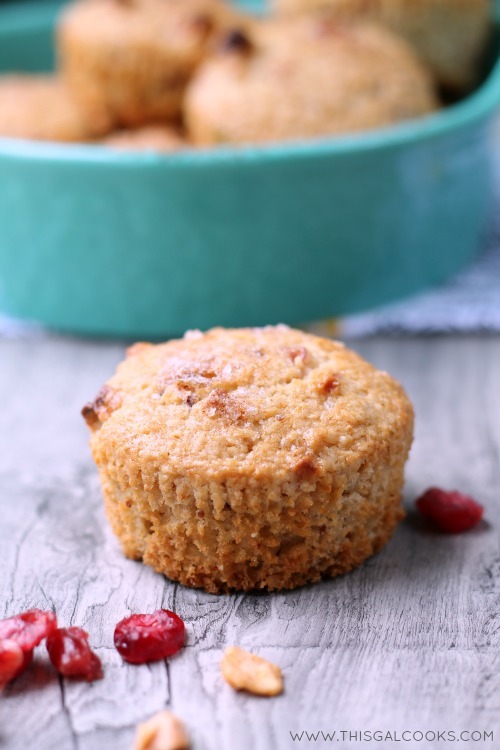 I’d love to make these muffins and have the whole house filled with the aroma… ok, I wasn’t ready for fall before, but now I AM! :) I found you via the ‘Best of the Weekend’ party on Little Miss Celebration! I have been loving all your vegan, dairy free posts. Definitely need to make some of these. I love berry muffins. Pinning now! Thank you, Krista! I have more coming. I might make something else this weekend too. Thanks for stopping by! 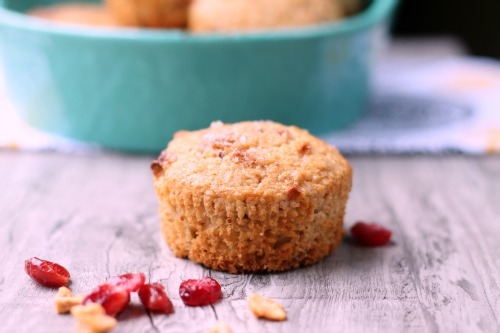 Muffins that taste awesome but are still healthy? Sign me up! Thank you for stopping by, Elizabeth!